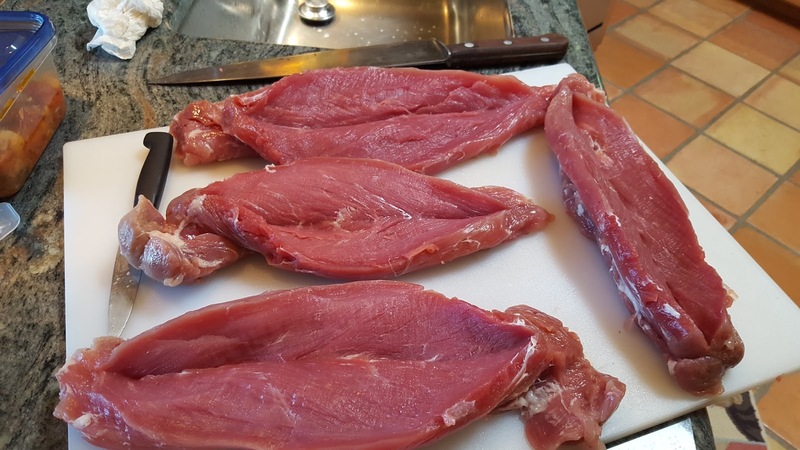 I love the versatility, tenderness and gentle flavor of Pork. 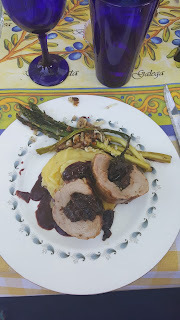 Our Il Secondo, or main course, for this year's Easter Feast was a stuffed Pork Tenderloin. The theme for this year's dinner was: To Tuscany with Love. 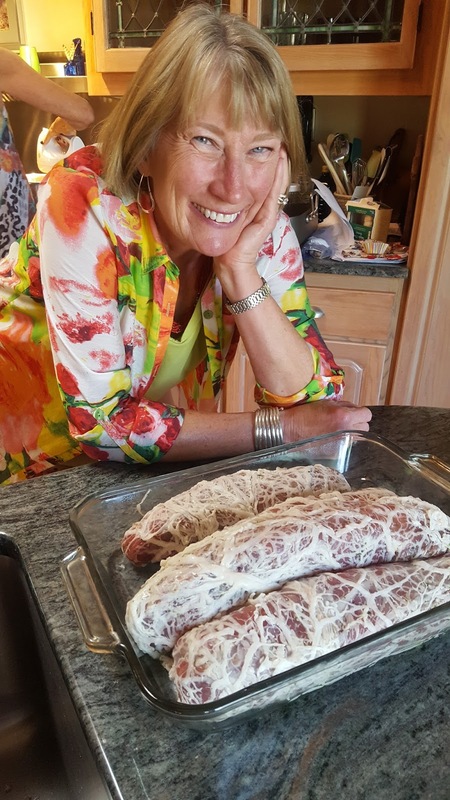 Although in Italy lamb is the traditional meat served at Easter Dinner, after doing a bunch of research I learned that pork is a close second favorite. 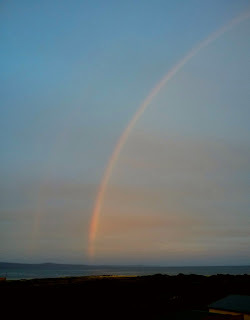 I just made this recipe again while here in Ireland. The Pork here is so delicate. Pigs are raised with love; not GMO! Notice the difference in size! I will intersperse tips from both recipes. Dried fruits of any kind pair nicely with pork. 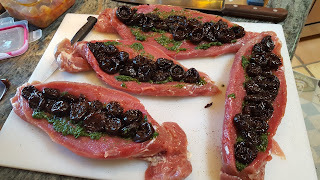 I have never used prunes alone, but they were delicious after marinating in a lovely Italian red wine for 2 days! Their texture breaks down and you can almost spread them inside the Pork. To marinate prunes just add prunes to a glass container and cover with red wine. Cover container and leave on your counter for a couple days. 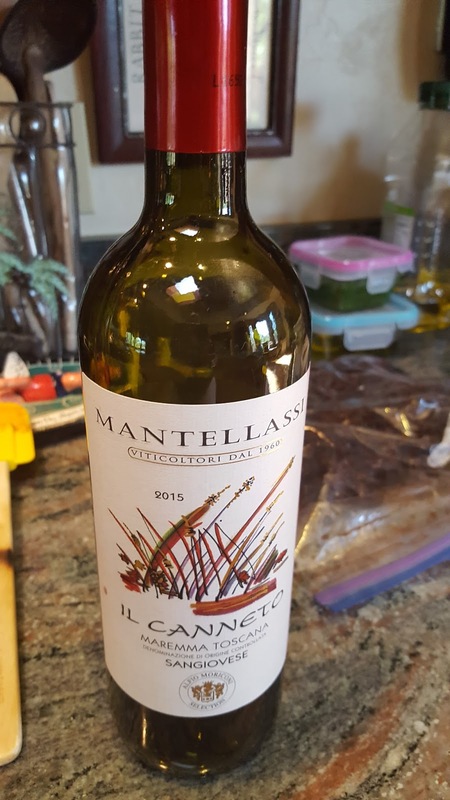 I also used this wine for the Red Wine Reduction that I served with the Pork. It was fabulous wine, which always makes for better cooking. but I did anyway. Because they were so small I only brined for 3 hours. Don't soak the pork overnight as it will absorb too much salt. After 6 hours thoroughly rinse and dry the pork before proceeding. The Red Wine Reduction can be made a few days ahead, kept in the fridge and reheated before serving. Heat the butter in a saucepan until bubbly. Add shallot, garlic and cook until just translucent. Do not brown. Add wine and turn to high heat to reduce by half. Add second tablespoon of butter. Season with salt/pepper. Add more butter to make a richer sauce. Strain pressing solids through a fine mesh strainer. Begin by removing as much silver skin and sinew as possible. This takes a little time, but is well worth the effort as pork will be more tender. With your sharpest knife cut the pork along the long side being careful not to cut all the way through. Open like a book to lay flat. 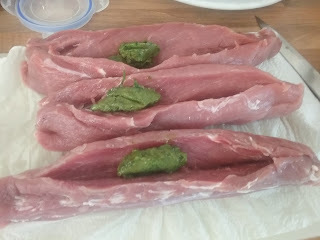 I used: rosemary, parsley, basil, thyme and a little sage; 4 cloves garlic, salt and pepper. Blend thoroughly in a mini-max and add enough oil to make a spreadable paste. our local butcher in Spiddal, Co Galway, IRE. Spread the paste inside the meat and then add a generous amount of marinated prunes. Just push in as many as fit. 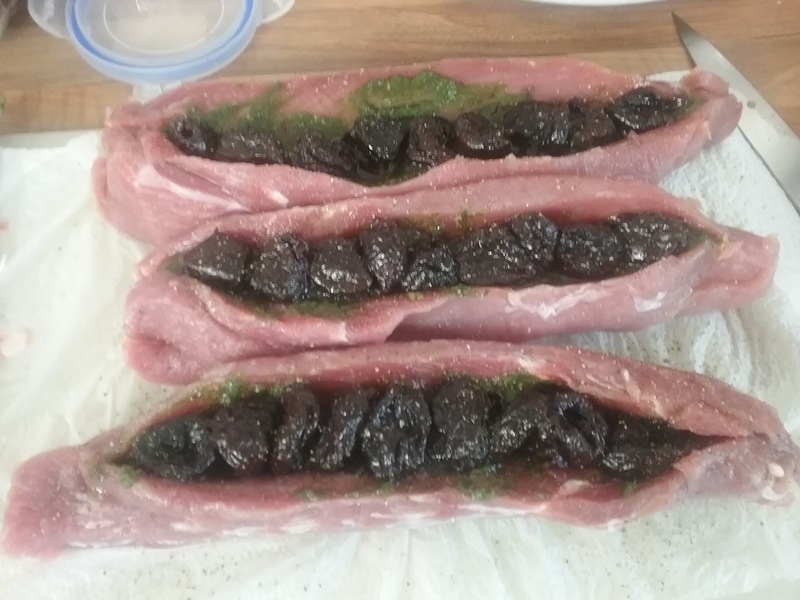 These are the Irish Pork Tenderloins stuffed with herbs and prunes. 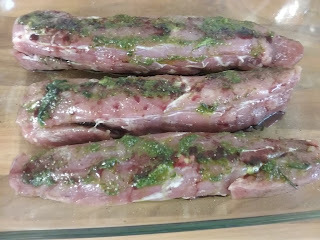 And here are the much larger Pork Tenderloins from Nogales, AZ. Next, roll the pork up and tie the roast. For Easter I used Caul Fat to wrap the Pork which meant no need to tie and the fat kept the Pork incredibly juicy. Caul Fat, also known as Lace Fat is the fatty membrane encasing the internal organs of an animal. 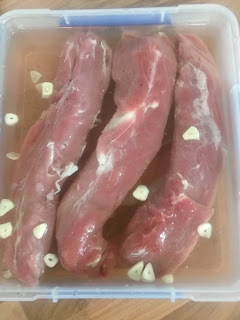 Pork is often used to wrap pates or sausages, but in this case I used beef Caul Fat. Very happy my meat is ready to rest before getting browned and then roasted. I left out on the counter for about 2 hours until beginning the cooking. and drizzled with the leftover wine from the marinated prunes. Brown the Pork on all sides in a very hot skillet with about 2 Tbsp. EVOO and 1 Tbsp. Butter. Get the pan smoking hot and then brown on all sides scraping up any bits. I did not brown the Tenderloins. Put the Pork in a 375 degree oven for 45 minutes. Check temperature with an internal meat thermometer. For Easter I had 3 very large Tenderloins roasting so total cooking time was 1 hour 15 minutes. The time will vary depending on size of meat (3 of the Irish Tenderloins equal 1 of the large U.S. Tenderloins) and how many pieces you are cooking at once. The internal temp should be 145 degrees as the meat will keep cooking after you take it out. Dry pork is not good. The Irish Tenderloin took much less time, but keep checking temp as it should also be done (medium rare) at 145 degrees. I cooked my Tenderloins for about 25 minutes. As with so many recipes there are endless variations. I hope this recipe inspires you to stuff your own Pork!